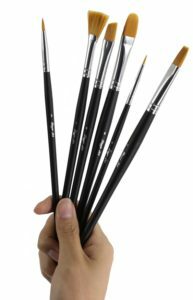 Brushes and paint are the first thing a novice watercolorist invests in, but too often that investment is squandered inadvertently by the mishandling and improper storage of watercolor brushes. Whether you’ve invested a large chunk of change on natural sable brushes, or you spent your last penny on an inexpensive synthetic brush set, you need to make sure that your brushes are well-cared for, or you’ll find yourself needlessly buying your beloved brushes over and over again. The first and most important thing to note is that you should never put your brush into a jar, point-side down. If you set your brush down on its bristles for any length of time, you will bend the bristles, and leave your poor brush with misshapen and splayed hairs. You should also never store your brushes upward, because after using your watercolor brushes, they will be wet, or at least damp. If you let your brushes dry with the point upward, the water will settle in the ferrule. The ferrule is the metal part of the brush, where the bristles are glued in. Over time, water settling repeatedly in the ferrule will break down the glue, resulting in a loss of your brush bristles. This would be a catastrophic loss if you spent a lot of money on a high quality sable brush, but even if your brushes are inexpensive, this is still an important rule, as the cheaper synthetic brushes already shed their bristles at a much higher rate than the more expensive natural brushes. If you shouldn’t store your brushes on end, then what is the best way to store them? Some artists like to store their brushes in a flexible roll-up or fold-up case. A flexible, fold-open case may be a good solution. Place them in the canvas rollup only after they are dry, not while they are still damp. If you have longer brush handles they may suffer a little bit of crushing stored in such a way. Check here for latest discounts for Rigger Art Canvas Roll Up Wrap. If you want to take the best care of your brush, you should store your brushes in a hard case, with plenty of room so the brushes are not smashing against each other. You should also keep the case lying flat at all times, so that the brushes are never standing on their ends inside the case. Note that wooden and specific brush cases are not cheap, but if you have natural hair brushes, it might be a wise investment. Most painters will need a canvas carry case to hold their brushes. If you take care of your brushes in this way, you will be able to preserve them as long as possible, and they will give you good service in return. Check out the premium canvas brush holder at Amazon, with 22 slots for your brushes, its a travel kit any painter may want to have. 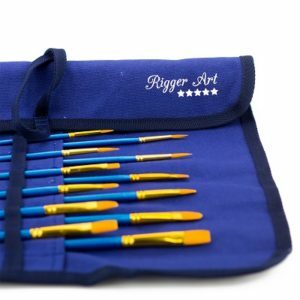 This entry was posted in Paintbrush Holder, Painting Brushes and tagged canvas brush holder, Paintbrush Canvas Roll Up, Paintbrush Holder Case, Paintbrushes Set, painting brushes, Rigger Art Brushes, watercolor brushes, Watercolor Paintbrush by RiggerArts. Bookmark the permalink.